It’s April, and in the Central Sands farmers are beginning to stir and get ready for action in the fields! The wind is from the south, and gentle spring rains are recharging the groundwater. The landscape is about to be awoken and soon to be thriving with growing vegetables–the Central Sands region is one of the nation’s premier potato and vegetable production areas. Just the warm and earthy smell of the soil after rain is an elixir to the farmers; they are ready for the season to begin! 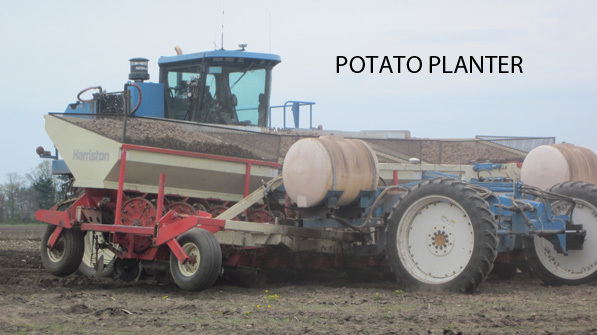 Farmers have been preparing to plant for the past few weeks with potato seed that took 3-4 years to produce in the northern reaches of the state, by carefully warming them to soil temperature and cutting them into perfect 2-3 ounce pieces that will give the new plant all it needs to grow and flourish. After cutting, the seed pieces are given a few days to grow a new protective skin that will prevent potential rots and avoid the need for artificial protectant. Now, it’s time to plant. The horse drawn, one-row was a vast improvement, but still fell far short of the efficiency needed to feed today’s hungry population. To remain in business and meet society’s food demands, it’s not unusual for these same family farms to grow upwards of 750 acres of potatoes! Wisconsin springs tend to be short and this means the farmers have to plant all those potatoes in a 4-5 week stretch when nature provides them this opportunity. Modern planters have evolved to meet this need; they plant 4-12 rows at a time and often pull themselves using the power of 250 horses. They use precision technology to place the seed pieces at the exact spacing and depth needed to produce the myriad of end products demanded by the market place. They even use GPS technology and auto-steer to ensure efficient land use. Remarkably, these advances make it possible for a single farmer to get the entire crop planted in the narrow window that nature provides. Although modern farm machinery is expensive, it is a necessary investment because today’s consumers are more demanding than ever. As many as 25 varieties and specialty potatoes are planted each spring to meet the diverse needs of the marketplace. These varieties range from russets for the fresh market (great baked potatoes) and processing (fries and tater tots products), round whites for mashing and chips, red, yellow and even blue fleshed ones for salads, to odd-shaped, multicolored fingerlings. All of these require precise planting depths, spacing and fertility regimes that can only be provided by today’s modern machinery. So when you take that spring drive through the Central Sands and marvel at the sheer size of the farm machinery you see, remember that these are what are needed to supply the supermarkets of the 21st century with the diverse varieties of potatoes and vegetables we love. Let the growing season begin! Hello! Thank you for your comment. We appreciate the opportunity to stay up to date with food safety and environmentally-friendly practices, which all ensure that you get a quality product at the end of the day! We hope you continue to follow our blog and help us spread the good word of our important industry.